Want to talk? Click here to send us a message. Make sure you can answer “yes” to the following question: Did I do everything within my power to save my marriage/relationship? You deserve the assurance of a positive response to that question. So does your marriage. That usually includes giving marriage counseling a try—with an experienced, qualified psychologist or therapist. Maybe your spouse or partner has made the choice for you–that’s why the question is worded “within my ” You can’t give your spouse or partner that assurance but you can gift it to yourself. There’s a unique torment which can stay with you if there’s a niggling question in the back of your mind about whether you did enough to save the relationship. Most people who decide to divorce-or whose spouse has decided to divorce-panic. That’s understandable. Life is about to change in a big way. There’s so much to think about. So much to figure out. But people who achieve a successful post-divorce life, who find happiness and peace again, first achieved clarity about what they wanted life to look like after divorce. So before you put your house on the market or separate bank accounts or call a lawyer or mediator, buy a new journal [click here for one we are particularly fond of], find a quiet place where you will not be disturbed for awhile, and imagine it’s all been figured out and resolved. It’s a year down the road and life is back on course. Close your eyes and paint the picture of your best post-divorce life. You can’t achieve it if you haven’t first defined it and visualized it. Think big picture. By whatever process your divorce proceeds, you will need to take stock of what you own and owe. So start making a list. This does not need to include household and garage possessions necessarily unless you are concerned that your spouse or partner will remove these items without discussing with you. But it should include your major assets and all debts. If an asset has a title it should definitely be included on your list. Then gather all current statements that evidence the value of the asset or the balance on the debt. For a complete checklist to help get you organized, click here. Explore your options for the type of divorce you and your children will experience. There is no one right way to divorce. There is only the way that fits for your family. Some people represent themselves, utilizing the resources of a legal assistance center located in many courthouses including those in Kent, Berrien and Ottawa counties. At the other end of the spectrum are those that engage the services of a lawyer who may advise that there be no further direct discussions with your spouse or partner. In between those two poles are a number of options including utilizing a consulting attorney, mediation or collaborative law. This is probably the most important decision you will make and will dictate what kind of divorce you will experience. We are well aware that the options can be overwhelming and confusing. We are committed to simplifying matters, ensure you understand your options, and together choose the best fit for you and your family. Call us to schedule a time to sit down and talk it through. You aren’t obligated to take the next step but when you are ready to do so, you are at least informed and will know what path to take. Our friends and family members want the best for us. They are hurting for us and want to protect us. They might “encourage” you with statements like, “take him to the cleaners” or “make it miserable for her since she’s the one that wants the divorce.” To them that looks and feels like love and support for you. But they may not be privy to the ideal divorce you’ve identified for yourself in Number 2 and they may be too close to the situation to help you think dispassionately about how to achieve it. So if you’ve declared that you want your children’s sporting events or recitals to be tension-free for them, choose people who will give you support by helping you get there rather than people who simply want to demonize your spouse or partner. Look around and find those people who’ve done divorce well, people who aren’t in constant conflict with a former spouse and whose children are thriving. Ask them how they did it and even consider asking if they’d mentor you through this process. Many people are more than happy to use their experience to help others and will welcome the request. Consult with a well chosen attorney sooner rather than later. You may only want to get a peek at what a divorce might look like, but your circumstances are unique to you and your family and you want to approach your divorce with care and wisdom. 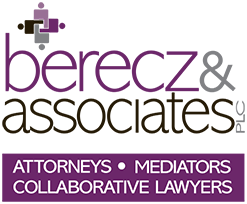 The attorneys at Berecz & Associates, PLC are committed to partnering with our clients to help them choose the right approach for their families and always consider first the least intrusive and least expensive options. We look forward to meeting you. We’ll get through this together. Prefer email? No problem, use the link below to contact us.